Sorry MuffyBee: don't understand Spanish either. That's okay Robert, maybe Cecilita or one of our other Spanish speaking monkeys will come by and help us out. I'm sure there will be translations on the news as we go, but I think it's very interesting to hear what's being said from our members. Good morning trimmonthelake, EURobert, pinkbanana, kcrn, orchidfae and our 7 Guests are viewing this topic. LIMA, Peru (AP) — Joran van der Sloot has entered the court where a panel of three female judges will try him in the 2010 murder of a 21-year-old Peruvian woman. The 24-year-old Dutchman entered in a blue blazer and faded blue jeans with a bullet-proof vest beneath the jacket. His has a close-cut crew cut and is wearing a long-sleeve gray shirt. An interpreter is being sworn in. The Dutchman's attorney said his client may enter a guilty plea. In a last-minute defense strategy change, Joran van der Sloot is expected to plead guilty to all the charges against him in connection with the killing of a Peruvian woman, his lawyer told CNN Friday. The original plan going into the trial, which was set to begin Friday, was to admit to killing 21-year-old Stephany Flores, but to fight more stringent charges that could land him more time in prison, attorney Luis Jimenez said. Jimenez said the intention of the new strategy is to give a "sincere confession," which under Peruvian law can qualify him for a more lenient sentence. 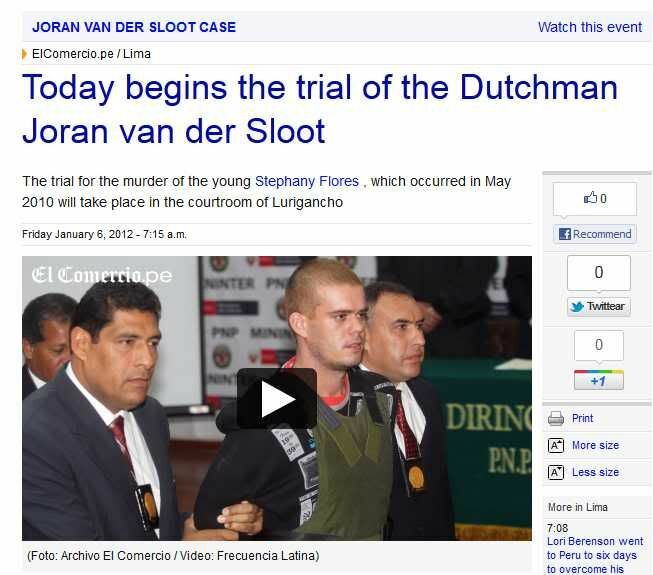 If van der Sloot goes forward with this approach, he could be sentenced as early as next week. A shaman performs a ritual for the spiritual punishment of Joran van der Sloot, in poster top center, and for justice for Stephany Flores, in poster at left, before Van der Sloot's trial outside the prison where the trial will be held in Lima, Peru, Friday Jan. 6, 2012. 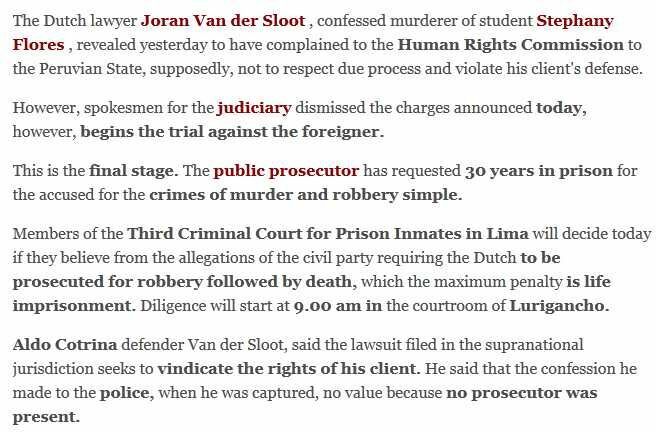 The trial of Joran van der Sloot opens today in Lima, Peru. He is accused of killing a Peruvian woman in 2010 and was suspected in the murder of Natalee Holloway in Aruba five years earlier. 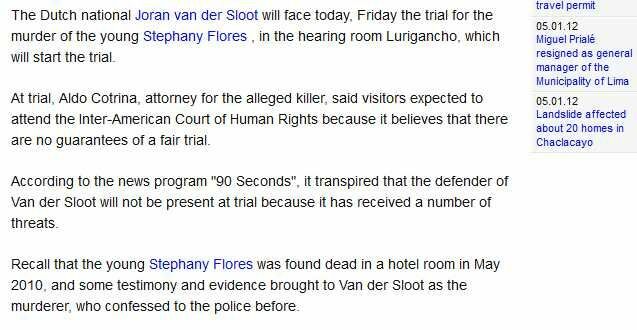 While the trial, which could drag on for months given the evidence in the Flores murder as well as the circumstance surrounding the Holloway case, will be about van der Sloot's culpability, the real issue appears to be how long he will spend in prison. The state prosecutor’s office is asking for van der Sloot to be found guilty of first-degree murder that was premeditated and “cruelly and ferociously” carried out. The maximum sentence is 30 years, but there is the possibility of parole. The prosecutor had originally asked that the charge be aggravated robbery followed by murder, which carries a life sentence without parole. The court rejected that option in November. Peru’s legal system does allow for the defense or prosecution to request a change in the charges when trial gets under way. Van der Sloot could plead out during the opening hearing, accepting the charge, but that would mean the maximum sentence. His defense attorney, José Luis Jiménez, said that while there is no disputing the murder charge, he will fight for the aggravating circumstances to be dropped. “Our job is to show that this was a tragic event that my client did not intend to happen. It was not done out of cruelty and certainly was not premeditated. No one makes the kinds of clumsy mistakes my client made if they had planned a murder,” he said on Thursday outside a Lima courtroom. If Jiménez successfully convinces the three-judge panel with his arguments, van der Sloot could be convicted of manslaughter, which carries a seven- to 20-year sentence. “He would likely get the maximum sentence, but the law allows for parole after one-third of the sentence is served,” said Jimenez, who took over the case last June after meeting van der Sloot in prison. Under this scenario, Jiménez said van de Sloot could technically be out of prison in 2017. ‎#JoranvanderSloot is requesting for the prosecutor to speak slowly because he is having a hard time understanding. The prosecutor wants to introduce new evidence including an overheard conversation b/w #JoranvanderSloot and Stephany Flores. ‎#JoranvanderSloot's translators are for English and Dutch. The panel is talking to #JoranvanderSloot about the use of the interpreters. Interpreters for #JoranvanderSloot are taking the oath. They might put a vest on him, but that big head is open, I'm just sayin! He's a pig. Can't even stay awake for his own murder trial. Here's hoping it's a great day for Stephanie and Natalee. IMO, Joran is thumbing his nose at his victim and her family by acting like he's nodding off. I continue to hold hope there will be justice for both Stephany and for Natalee. Page created in 5.71 seconds with 20 queries.